Forty years ago Charles Townshend’s first book ‘The British campaign in Ireland, 1919-1921’ was published to academic acclaim as one of the first in-depth military histories of the the Irish War of Independence. Since then he has published numerous books on the Irish and Palestinian “questions”, the history of the Middle East and the legacy of the British Empire. Given that his last book was hailed by many as one of the most impressive accounts of the 1916 Rising, Townshend had set himself a difficult act to follow. Thankfully his latest offering ‘The Republic – The Fight for Irish Independence’ charting the events of the Irish War of Independence and Civil War, does not disappoint. Townshend is often thought of as a ‘military’ historian, and any book by him on the War of Independence was bound to be interesting – but in this work he exceeds expectations chronicling both the political, and military, events of the War of Independence and Civil war as well as providing a succinct account of the developments that preceded them. Townshend’s introduction to the work provides a brief, but excellent, analysis of the character and politics of militant Irish Republicanism from its birth in the 1790s to the remnants of the Fenianism at the turn of the last century. He then goes on to examine in detail the causes and developments of the War of Independence and Civil War. A weighty hardback, with over 450 pages in the main text, the book looks at first glance like a foreboding tome, but Townshend writes in a very clear style easy to follow for both scholars and non-academic historians. The author is to be applauded for successfully narrating one of the most crowded and complex periods of Irish history tying together such diverse strands as the role of the IRB, the Catholic church’s attitude to republican violence, the disintegration of the RIC, the role of Labour and the Trade Unions, the role of women and the Treaty split without confusing or crowding the reader. Throughout the book Townshend regularly addresses difficult issues: Were the British officers killed by the IRA on ‘Bloody Sunday’ really all intelligence agents? did southern IRA units unjustly target Protestant Loyalists? and of course, the recent heated Kilmichael Ambush controversies. He presents the reader with a condensed account of each controversy, spelling out the facts and outlining the views of the different protagonists. Although I think it would be fascinating to get Townshend’s own personal views on these controversies he maintains an impartial narrative throughout, for which he cannot be faulted. The author introduces the reader to the periods controversies while remaining impartial. Whilst “The Republic” is an excellent book, Townshend occasionally confuses, or loses some of the detail when examining events at local level. For example when discussing the IRA’s execution of civilians they accused of being British spies he states that the IRA killed a Patrick O’Gorman, a Limerick Cattle dealer, because he was having extra marital sexual relations with a local woman. In fact O’Gorman was suspected of supplying the British forces with information that led to the capture and brutal murder of IRA Volunteer William Slattery. O’Gorman readily boasted of his role in the affair when questioned by IRA men disguised as British officers, he even complained that he had not been paid for the information he gave about Slattery. There can be no doubt that this, and not his love life, was undoubtedly the reason why the IRA targeted O’Gorman. Furthermore Townshend was wrong in stating the IRA had killed O’Gorman, although he was attacked by the IRA he survived and went on to claim compensation for his injuries. Townshend also gets the name of the Irish national anthem wrong (Soldiers Are We?) and makes a few other minor but noticeable mistakes regarding the dates of significant ambushes or the biographies of IRA leaders. I also thought that the conflict in Ulster during the War of Independence, and the Civil War as a whole were possibly deserving of a more in-depth treatment. However these few caveats should not be allowed to detract from Townshend’s excellent achievement in writing a book of this quality. Whilst I would not agree with some of his conclusions, he is fair and consistent throughout, and has succeeded in the writing an excellent, concise history of the Irish Revolution which charts in detail all of the most important political and military developments at national and regional level. Townshend’s first book has stood the test of time and is still regarded decades later as a classic – I am confident that his latest work will be similarly renowned in years to come. Pádraig Óg Ó Ruairc is a PhD student at the University of Limerick. He has published a number of books and articles on the War of Independence & Civil War in Clare and Limerick. His most recent book “Revolution – A Photograph History of Revolutionary Ireland 1913 -1923” was short listed for the Best Irish Published Book categor in the 2011 Irish Book Awards. 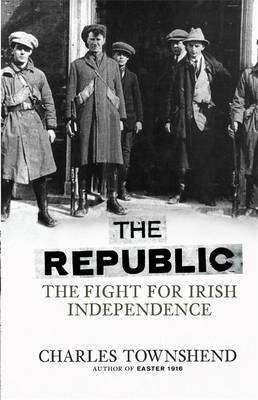 6 Responses to "Book Review: ‘The Republic – The Fight for Irish Independence.’"
This is very interesting – does he address the various debates in ethnic cleansing , sectarianism etc? There are weaknesses in Townshend’s approach, resulting from the manner in which he frames the debate around the late Peter Hart’s original argument. Anodyne, carefully managed with errors, is one way of describing it. Are errors corrected in later prints? Whose ‘later prints’? Townshend or Hart’s? On page 100 of his book, Hart had written of ‘these political serial killers’, including Barry. He equated the IRA operation at Kilmichael with ‘the assassins of [Cork Lord Mayor] Tomás MacCurtain and [of] the victims at Clogheen and Clonmult’. Hart did not change his mind about the ‘virtually indistinguishable’ equivalence of IRA and Crown force behavior. In Hart’s introduction to ‘Rebel Cork’s Fighting Story’ (Mercier, 2009, page 26), the Clonmult massacre was still ‘Kilmichael in reverse’. Hart never explained how he managed to interview a Kilmichael Ambush veteran on 19 November 1989, six days after the last recorded veteran died, or other assorted anomalies and oddities. Some time ago, Dr Eve Morrison reported that she was on the trail of the mystery 19 November man. See my ‘Examining Peter Hart’: http://www.academia.edu/8348624/Examining_Peter_Hart. In 1997 (‘Unionism in Modern Ireland’ collection) Hart said the April 1922 killings in the Bandon Valley could be termed a form of ‘ethnic cleansing’. He later ‘corrected’ himself (in ‘The IRA at War’, 2003) by saying he had never made this argument. Again, see ‘Examining Peter Hart’. I assume the question is about Charles Townshend Niall.